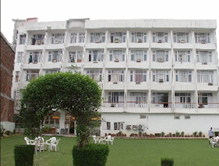 Hotel Ambika is enshrined at the foothills of Trikuta Hills in Katra. This comfortable hotel is well facilitated for a relaxing stay. The hotel is situated in the middle of the town and is easily accessible for the tourists. It is a great value for money. Hotel Ambika is a 3 star hotel that offers both the luxury and budget tourists a convenient and cozy stay. All the major attractions of Katra are in close proximity to the hotel. The hotel is renowned for its way of hospitality and the staff that is always present to assist the guests in the best way possible. Accommodation The rooms in Hotel Ambika are elegantly designed and well appointed. All the rooms have a balcony and attached bathroom. Both the hot and cold water is available all round the clock. The rooms are further categorized into Double Deluxe AC rooms, Deluxe suites, Tripple Bedrooms, and family deluxe rooms. The rooms in the hotel are equipped with the comforting amenities such as air conditioner, color TV, telephone and much more. Round the clock room service acts as a cherry on the cake of comfort. Dining The hotel has a multi cuisine restaurant Rukmani that offers purely vegetarian delicacies. This restaurant is fully carpeted and provides the food delicious enough to stimulate the taste buds of the patrons. The services are fully personalized. Dining services in Hotel Ambika, tenders a lip smacking experience to the guests and acts as the icing on the cake for the tourists coming to this sacrosanct region. Credit Card and Master Card Accepted. Tour My India guarantees the hassle free booking at the hotels of Katra. The enticing list of hotels in which we provide the best deals for accommodation, includes Hotel Ambika as well. 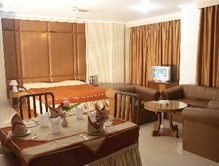 Avail the accommodation packages, from Tour My India, and enjoy the relaxing stay in Hotel Ambika.